Honorary Graduate John Byrne pictured at Wednesday afternoon's graduation ceremony. Honorary graduates John Byrne and Sir John Elvidge inspired almost 700 graduates at two University of Stirling summer graduation ceremonies today. Artist and playwright John Byrne, best known for his play 'The Slab Boys' and multi-BAFTA award-winning TV series 'Tutti Frutti', was recognised for his distinction in the arts at Wednesday's afternoon ceremony, which also celebrated the achievements of graduates from the School of Arts and Humanities and the School of Sport. 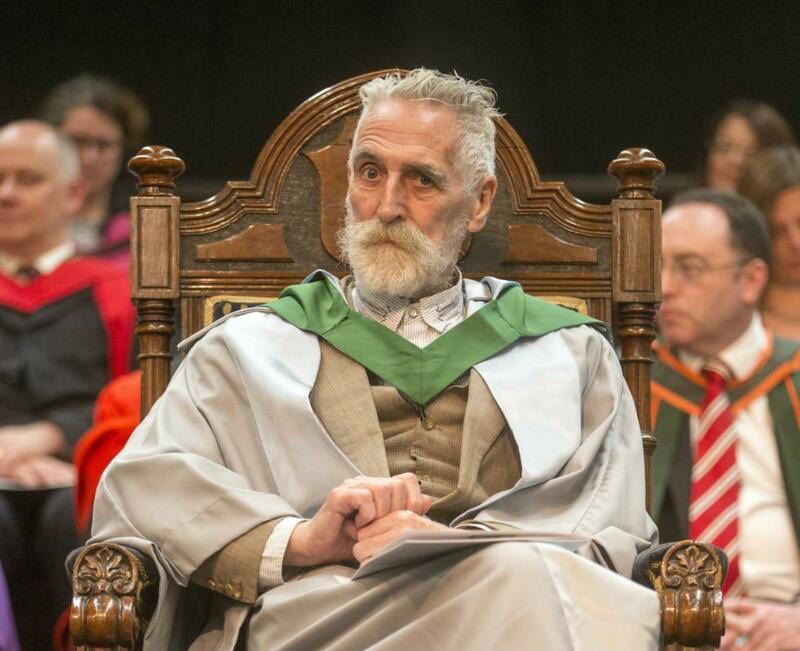 After congratulating the graduates and thanking the University for the day, John Byrne ensured his advice for the class of 2015 was concise and memorable: "Always remember, never take any advice. Just go your own way and do your own thing." During Wednesday's morning ceremony, Sir John Elvidge, former Permanent Secretary to the Scottish Government, received an honorary doctorate for his outstanding contribution to the wellbeing of the people of Scotland and his dedication to the Modernisation of Public Services. After congratulating new graduates from the School of Education and Stirling Management School, Sir John stressed Stirling's role in creating transformational change in the opportunities available for young people. Sir John said: "The idea that either of my parents might go to university was inconceivable. When I went to university in 1969, I was still only one of 7 percent of people of my generation to do so. Now, half of all young people in Scotland have the opportunity of attending a university or college. The foundation of the University of Stirling was a vital part of that transformation of opportunity in our society." Sir John also revealed that today’s graduation ceremony had a particularly personal resonance for him. "I didn't go to my own graduation ceremony and I deeply regret depriving myself and my parents of that opportunity for celebration. So I thank the University for more than making up today for my mistake 42 years ago!" he explained. Tomorrow's final summer graduation ceremony will see almost 400 graduands from the Schools of Applied Social Science, Health Sciences and Natural Sciences receive their degrees and academics awards, along with broadcaster Sally Magnusson and former University Secretary Kevin Clarke, who will receive honorary degrees. The ceremony, which will start at 11am, will be broadcast live via a graduation webcast. A range of graduation photos, social media and case studies are available at our dedicated Graduation Summer 2015 Live webpage.